Knit in the round using your favorite method for small circumfernce items. I used a 16 inch circular needle and switched to two circulars once the hat was too tight for the 16 inch. You could use one long circular needle or double points as well. With size 10.5 needle and boucle loosely cast on 60 stitches for Women’s, (WS 52, Y 44, B 40). Place a marker and join, being careful not to twist the stitches. Knit each round until cuff measures 2” for all sizes. Cut Boucle leaving a tail for finishing. Knit each round until 6 (5 ¾, 5 ½, 5) inches from cast on edge. Top decreases: Start with round 1 (5, 9, 11) changing to dpn, see note 2, when needed. Cut yarn and draw through last 6 sts, fasten off. 1. Some additional suitable yarns, Homespun, Homespun Baby, Jiffy, Baby Cloud, Light and Lofty. 2. 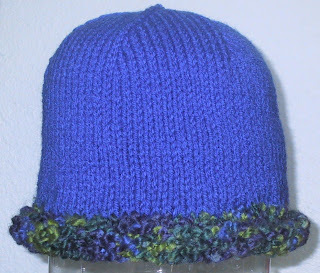 Knit hat with your preferred method for knitting small diameter items. When stitches get too tight on the 16” circular switch to working with double points, a second circular or one long circular and continue decreases. Here's a link to a site that shows increases.